Even small efforts to reduce household waste are a big step in the right direction. And it doesn’t get much smaller than worms. Yes, worms can help you compost by digesting your scrap food (excluding meats, dairy, and fat) and by producing super-concentrated fertilizer (a.k.a. worm poop). That is what vermicomposting is about. 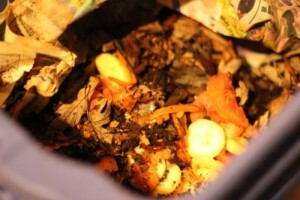 My neighbor Erin and her family started vermicomposting about a year ago. They continue to compost in their yard as well because the worms can’t handle all the scraps of a family of four. But what they do take on turns into black gold for their plants and garden. Erin’s father, a vermicomposting enthusiast, got her started with one bin full of worms that now sits in their basement. They feed their little helpers kitchen scraps about twice a week. That’s as much maintenance as they usually need. If the bin is too dry, simply add water. If it’s too wet, drain it and use the extra liquid to fertilize house plants. After a few months a thick layer of extra-strong compost is ready for harvest. 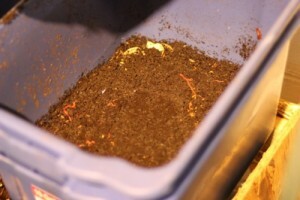 I really enjoyed learning about vermicomposting and seeing how it works firsthand. What surprised me the most was the lack of odor coming from the bins. I expected to smell fermented fruit and vegetables but that wasn’t the case. It looks fairly easy to set up and maintain. Erin said that they bought the worms from a local farm that later closed, so you may have to do a bit of searching to find your own. This Wisconsin site may be a good start.